Here you will find articles written by club members. 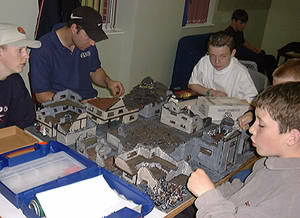 You will find everything from House Rules to Mordheim Warbands to Terrain Building. This section should grow into quite an interesting resource, so if any member wants to contribute, you are more than welcome. If you would like to contribute, here are a few ideas for articles; Figure Painting, Battle Reports, Army Lists, Home Grown Games, Games Day Reports, Stories, Artwork, the list is almost endless, the only requirement is that it would be of interest to other Wargamers. If you have written anything that others may find useful or interesting, please contribute.